When I was in college, I started watching Days of Our Lives. I became hooked for quite some time and would watch every day on my lunch break. Sami stood out to me a lot. I think she was always scheming to go after her sister Carrie's boyfriend and was unlikable at the time. (Yes, this probably ages me quite a bit, if you do the math.) I caught episodes every so often over the years and I think Sami became more likable at that point. In any case, this iconic role was played by Alison Sweeney, who is now writing chick lit novels. We recently received the opportunity of a lifetime....to interview Alison at CLC! 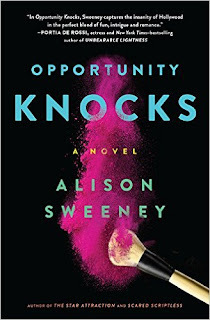 Speaking of "opportunity," her latest novel is called Opportunity Knocks and it caters to fans of The Devil Wears Prada. Thanks to Hachette, we have FIVE copies to give away! Alison Sweeney is an award-winning actress, producer, director, TV host, and author of four previous books, including the two novels Scared Scriptless (reviewed here) and The Star Attraction (reviewed here). Sweeney starred for almost 22 years on Days of our Lives and has appeared on numerous additional prime time television series. In 2015, she began starring in and executive producing the Murder She Baked franchise of TV movies based on the culinary-mystery bestseller by Joanna Fluke. She lives in Los Angeles with her family. You can find Alison on Facebook, Twitter, and Instagram. Alex Cleary lands her dream job as a makeup artist for Hillary P.—a lifestyle empire mogul and culinary TV star who is renowned for her golden touch in broadcast in print media despite her less-than-lovely reputation behind-the-scenes. It’s a once-in-a-lifetime opportunity, providing a steady paycheck and limitless possibilities for her blossoming career as a makeup artist to the stars. Yet when Alex inadvertently violates the confidentiality clause of her contract, her dream career might quickly turn to dust. She’s on the hook for $5 million unless she can squash the problem within 48 hours. With help from a Hollywood heartthrob, Alex concocts an elaborate scheme that might get her off that hook, but everything will have to run precisely as planned, and the clock is already ticking. How did you go from acting to writing novels? Honestly, I was frustrated with a story line and used writing as a way to get out my frustration by writing a story that I wanted to tell. I’d never taken classes but once I started writing, I couldn’t stop. I love it. There are so many incredible writers but I’m personally a huge fan of Jodi Picoult's. When she wrote a quote for my first novel, Star Attraction, I was so excited. Do you have a favorite character or one you most identify with (from any of your books)? I think there’s a part of me in each book since it’s easiest to write based on what you know. All three lead characters take chances and that’s definitely based on my life. If you could cast Opportunity Knocks as a movie, who would play the lead roles? That’s something I’m so often asked but I don’t have an answer. There isn’t a specific actor that I had in mind as I was writing so it would be based on delivery more than looks. What is one of your all-time favorite summer reads? I could read Harry Potter over and over again. Portia deRossi’s Unbearable Lightness was heart-wrenching but her honesty was beyond inspiring. Thanks to Alison for chatting with us, Triple 7 PR for arranging the interview, and to Hachette for sharing her book with our readers. I hate to admit it but I have never watched Days of Our Lives. There have also been no opportunities that have come my way lately. A chance to go on a terrific trip with my daughter. I am really going to age myself when I say that one of my favorite storylines was when Bo kidnapped Hope from her wedding to Larry Welch and another was when they were in New Orleans at Oak Alley. I didn't watch Days. I was more of a CBS soaps watcher back in the day. :) I had a work opportunity come my way recently, which made me really happy! I never was a soap watcher. Recently I was able to catch up with an old friend whom I hadn't seen in many years. Never was a soap watcher. My opportunity was to catch up with some family and restrenghten the old ties. I used to watch "Days of Our Lives" when I was in high school. I liked the episodes where Kristen often schemed to get John back from Marlena. I also liked Bo and Hope's stories. Never was a soap watcher but used to listen to the radio soaps back in the 40s with my mother! Anyone remember Ma Perkins or Queen for a Day? In March I was able to be in the room when my nephew was born. An incredible opportunity I will never forget. I used to watch Days of Our Lives many, many, many years ago with my Mom. I don't watch soap operas anymore. I'd say a great opportunity that came my way back in March was winning a trip to Isle of Palms, SC. Room and board were included but had to find a way to get there. I found a way to get there thanks to my husband. That opportunity came at the right time as I needed a break after becoming a caregiver to my Mom last November. I haven't watched Days of Our Lives in 30 years. Sorry no opportunities either. Thanks for this chance. I've always loved the Bo and Hope story lines. Days of our Lives was a favorite of my mother's, when I was little. I used to know a lot about the characters, but I have no clue anymore. Bo and Hope. And, I do remember Sami, of course. I remember not liking her! :) I loved Sweeney on Biggest Loser. For Sami - herself - her story? Sami and Lucas. I just loved them together. I know EJ was a big hit, but Lucas - well - yeah. As for old school storylines, I was and will always be about Patch and Kayla. Their wedding and him signing to her, her hearing. Ahhhh. I well up just thinking about it! I first started watching Days of Our Lives when I was a teenager in Australia. Always loved Marlena and John. I was lucky to meet Deidra Hall and get her autograph many years ago. i never watched Days of Our Lives; always watched All My Children, One Life to Live & General Hospital w my Mom. haven't watched any soaps since she passed. something that came up recently was a chance to go to NYC with my boyfriend...wow, what a city!!! When I had knee surgery, I had to lie in bed for a long time during the summer. This was when I was in high school. My mother brought in the small tv into my room and would sit with me to watch some soap operas. This was the only time I watched them; so, I don't really remember any specific story lines. As for recent opportunities, nothing comes to mind other than becoming a grandmother. I was offered my old job back. It gave me great pleasure to say NO THANK YOU!! I have always liked Sammy's plots even when she would make me mad. I also loved the way Bo and Hope loved each other. I recently lost my sales job and while it was very stressful I wondered what I would do. Well I got back into performing Childrens music (mostly original) and I love it. And it's gratifying to hear the kids love it too. Our author - Alison Sweeney was my all time favorite actor when I watched the show back in the day! It's been many years. I have had some great things come my way - a trip to Boston this weekend and I am celebrating my 1 year Blogiversary! I loved any of the old storylines between Sami and Austin! I loved Sami with Lucas, and then with EJ, I thought both were such great fiery dynamics. Also her most recent storyline, dealing with the loss of Will, Alison Sweeney did such a great job with that. I have so many years to see Days of our lives. But I really loved the Bo and Hope story lines. My recent opportunity is with my older sister who suggested I start a small business providing simple tasks with computer work for businesses and with her current company. Excited! I loved any story line that Sammi Brady was in. The opportunity to go through the orientation process with my daughter on her first year of college.